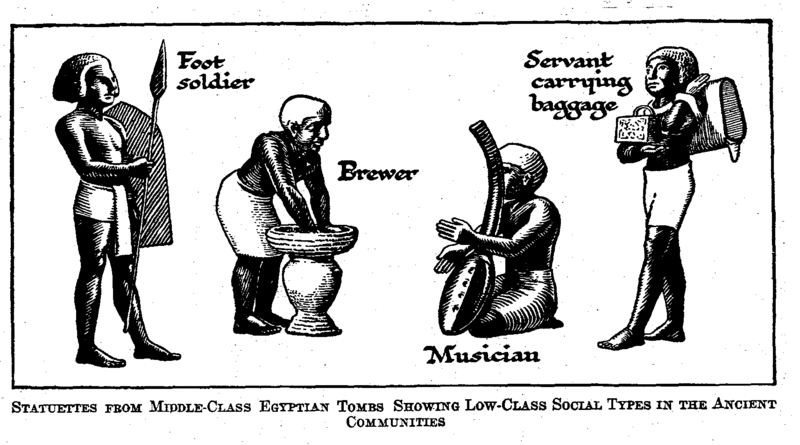 Statuettes from middle class Egyptian tombs showing low-class social types in the ancient communities: foot soldier, brewer, musician, servant. So, in a few paragraphs, we trace the development of the simple social structure of the early Sumerian cities to the complex city crowds, the multitude of individuals varying in race, tradition, education, and function, varying in wealth, freedom, authority, and usefulness, in the great cities of the last thousand years B.C. The most notable thing of all is the gradual increase amidst this heterogeneous multitude of what we may call free individuals, detached persons who are neither priests, nor kings, nor officials, nor serfs, nor slaves, who are under no great pressure to work, who have time to read and inquire. They appear side by side with the development of social security and private property. Coined money and monetary reckoning developed. The operations of the Arameans and such-like Semitic trading people led to the organization of credit and monetary security. In the earlier days almost the only property, except a few movables, consisted of rights in land and in houses; later, one could deposit and lend securities, could go away and return to find one’s property faithfully held and secure. Towards the middle of the period of the Persian Empire there lived one free individual, Herodotus, who has a great interest for us because he was among the first writers of critical and intelligent history, as distinguished from a mere priestly or court chronicle. It is worthwhile to glance here very briefly at the circumstances of his life. Later on we shall quote from his history. We have already noted the conquest of Babylonia by the Aryan Persians under Cyrus in 539 B.C. We have noted, further, that the Persian Empire spread into Egypt, where its hold was precarious; and it extended also over Asia Minor. Herodotus was born about 484 B.C. in a Greek city of Asia Minor, Halicarnassus, which was under the overlordship of the Persians, and directly under the rule of a political boss or tyrant. There is no sign that he was obliged either to work for a living or spend very much time in the administration of his property. We do not know the particulars of his affairs, but it is clear that in this minor Greek city, under foreign rule, he was able to obtain and read and study manuscripts of nearly everything that had been written in the Greek language before his time. He travelled, so far as one can gather, with freedom and comfort about the Greek archipelagos; he stayed wherever he wanted to stay, and he seems to have found comfortable accommodation; he went to Babylon and to Susa, the new capital the Persians had set up in Babylonia to the east of the Tigris; he toured along the coast of the Black Sea, and accumulated a considerable, amount of knowledge about the Scythians, the Aryan people who were then distributed over South Russia; he went, to the south of Italy, explored the antiquities of Tyre, coasted Palestine, landed at Gaza, and made a long stay in Egypt. He went about Egypt looking at temples and monuments and gathering information. We know not only from him, but from other evidence, that in those days the older temples and the pyramids (which were already nearly three thousand years old) were visited by strings of tourists, a special sort of priests acting as guides. The inscriptions the sightseers scribbled upon the walls remain to this day, and many of them have been deciphered and published. As his knowledge accumulated, be conceived the idea of writing a great history of the attempts of Persia to subdue Greece. But in order to introduce that, history he composed an account of the past of Greece, Persia, Assyria, Babylonia, Egypt, Scythia, and of the geography and peoples of those countries. He then set himself, it is said, to make his history known among his friends in Halicarnassus by reciting it to them, but they failed to appreciate it; and he then betook himself to Athens, the most flourishing of all Greek cities at that time. There his work was received with applause. We find him in the centre of a brilliant circle of intelligent and active-minded people, and the city authorities voted him a reward of ten talents (a sum of money equivalent to £2,400) in recognition of his literary achievement… . But we will not complete the biography of this most interesting man, nor will we enter into any criticism of his garrulous, marvel-telling, and most entertaining history. It is a book to which all intelligent readers come sooner or later, abounding as it does in illuminating errors and Boswellian charm. We give these particulars here simply to show that in the fifth century B.C. a new factor was becoming evident in human affairs. Reading and writing had already long escaped from the temple precincts and the ranks of the court scribes. Record was no longer confined to court and temple. A new sort of people, these people of leisure and independent means, were asking questions, exchanging knowledge and views, and developing ideas. So beneath the march of armies and the policies of monarchs, and above the common lives of illiterate and incurious men, we note the beginnings of what is becoming at last nowadays a dominant power in human affairs, the free intelligence of mankind. Of that free intelligence we shall have more to say when in a subsequent chapter we tell of the Greeks.